MetaMoJi’s Yacho digital field book application will be made available to ScanData field engineering teams which work across the UK with that nation’s leading engineering consulting firms, major construction companies and water authorities. 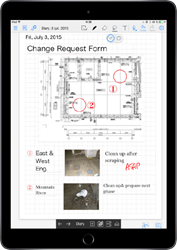 MetaMoJi’s new Yacho application is a game changer for engineers in the field. It will enable us to work with, capture and instantly report critical and time-sensitive field information and data. MetaMoJi, a leading global provider of productivity and industry efficiency applications, and ScanData UK Ltd, preferred choice for CCTV and drainage field surveys across the United Kingdom, announced today a partnership to provide MetaMoJi’s Yacho mobile field application to all of ScanData UK ‘s engineers. In October 2015 ScanData UK and their IT consultants, fusion242, created a solution to optimise the inspection and maintenance of their customers’ assets. The solution includes cloud infrastructure and applications to store asset information and documentation, RFID tagging to allow field workers to quickly scan and look-up asset details, and custom processes to monitor work progress and create reports for the project management office. Following initial field trials, ScanData UK’s field team identified an immediate need for a mobile application that would allow field workers to pull down and display relevant and essential information from the cloud system and then to create new information in the form of field notes, forms, photographs and video. The first thought was to build a completely new application to meet these requirements. The cost of this approach was analysed and found to be prohibitive to the cost saving goals of the project. According to Walshaw, this created more issues than solutions as the apps were not all able to communicate with each other to extend functionality, and most importantly not able to communicate with the cloud based system used by ScanData UK. ScanData UK quickly decided that the solution was MetaMoJi’s new Yacho digital field book application. The fame of MetaMoJi’s deeply experienced software team which has time and again created and fielded market-leading mobile productivity apps used across all industries in Japan, was also a factor in ScanData UK’s choice. ScanData UK already uses the MetaMoJi Note and Share applications and had been watching the development of their new Yacho application with great interest. The ScanData UK team then approached fusion242, who are also consultants to MetaMoJi, with a request to find a way to integrate the Yacho application and use it as the mobile field application within their solution. MetaMoJi also proposed a customized way for ScanData UK to open access to the Yacho application, allowing full integration and full functionality with other fielded IT systems and forms. Yacho is the ideal enterprise app for information distribution and creation. For system integrators and enterprise customers like ScanData, the Yacho documents can be woven into existing applications that support business-process and business-rule management. Yacho’s existing, superior capabilities and the custom adaptation developed by ScanData UK will now enable its field workers to load existing documentation to their mobile devices, create new information through the completion of forms and notes, and allow the extraction of this information back into ScanData UK’s back office systems for reporting and notifications. Where a signal is available to connect to the internet, the data can be instantly submitted back to the cloud, for example, allowing an alert to be immediately generated or for intra-day reports to be generated. The use of RFID technology alongside the Yacho mobile app allows the ScanData UK engineers to use NFC readers to request information from the cloud based core system when they arrive at an asset. This information can be automatically packaged into a Yacho document and delivered to the engineers’ device through email or a direct download. The use of RFID, for example, saves time identifying assets and searching for their information. Using the Yacho document format allows multiple types of document and media information to be combined into a single document, giving the engineer everything they need in a single app. Yacho also uniquely enables users to build completely customized forms to represent any type of business. For example, ScanData UK will use Yacho to automatically generate manhole inspection cards, prefilled with known information, which can then be stored and processed in the back office. For one client, ScanData UK performed a series of inspections on sites across the UK over a 30-day period. Only after the inspections were complete did the project management team get a full picture of the issues, with an information flow fragmented due to the number of people involved. Yacho will dramatically streamline that process. Another common problem is the inspection of field assets that cannot be completed efficiently because of auto, truck or rail traffic. These environments require additional, costly resources in traffic-management equipment and people to set up a safe cordon. Using the new system, the engineer completes the inspection form in Yacho without interrupting the flow of traffic, selecting a status code from a drop down box. As the information from Yacho is extracted at remote centers, it is also added in reports so that ScanData UK’s customers can get a quick overview of all work taking place as it is reported, allowing lessons to be learned and better decisions to be made. The benefits also apply to ScanData UK itself. Using Yacho allows processes that were previously paper based to be digitised. This means that less data needs to be re-keyed into systems, information can be delivered from site without first transferring into a digital format, and data can be generated enabling statistics and analysis to be performed more easily. ScanData UK Ltd, based in the United Kingdom with principal offices in Surrey and Yorkshire, provides CCTV field surveys of drains, utility maps, and CAD drawings. ScanData UK is the preferred choice for CCTV and drainage surveys across the United Kingdom, having been contracted to conduct work for that nation’s leading engineering consulting firms, major construction companies and water authorities. ScanData clients include Costain, OPA, Subscan Technology, Ramboll Whitby Bird, J Sainsbury’s, Omega projects, Longcross, Buro Happold, Pd Ports, Daubney Ltd, Avoin Maa Surveys, H J Consulting Engineers, Pegasus Homes, Hagemeyer, Xpose Surveys, Murphy Group, Robinson Consulting, Harvey Middleton, Arup and many more. Visit ScanData at http://www.ScanData.co.uk on the Internet.